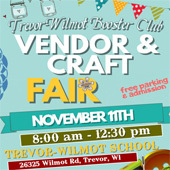 The Trevor-Wilmot Booster Club is hosting its 7th Annual Vendor & Craft Fair on Nov. 11 from 8 a.m. to 12:30 p.m. Parking and admission to the craft fair is free. The craft fair will take place in conjunction with the Trevor-Wilmot Consolidated Music Department Pancake Breakfast from 8 a.m. to noon. Cost for the breakfast is $5 for adults and $3 for children 4 and under. There will also be raffle and musical performances by band and choir students. Breakfast proceeds benefit the TWC Music Department.